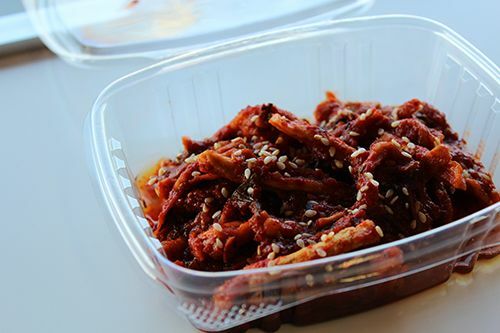 There has been a lot of buzz around the opening of a new Korean take-out restaurant here in the south side of Edmonton. There is not much activity in the food scene around Southgate so when a new establishment opens it can be pretty exciting. With the grand opening this past Monday (March 31st), my boyfriend and I stopped by on the way home to pick up some small dishes to add to dinner. Arriving at about 6PM the tiny little place was packed. There was literally no way to walk around the inside without brushing up against someone else. Whoa. The two of us originally thought it wouldn't be too busy and we would be in and out of there in under ten minutes. Guess not! Congratulations to Mama Lee for having a successful opening day! 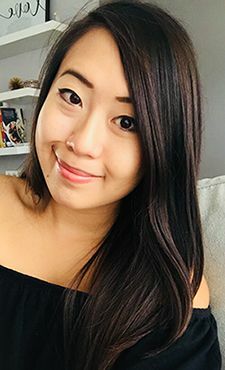 Mama Lee's Kitchen is a family venture opened by a Korean family that has lived in Edmonton for quite some time. With the mother of the family constantly praised for her cooking, the family took the opportunity to open up a little take-out place. When you step inside you're met by a quaint space with a few seats for dine-in (maybe 8-10 seats at most). 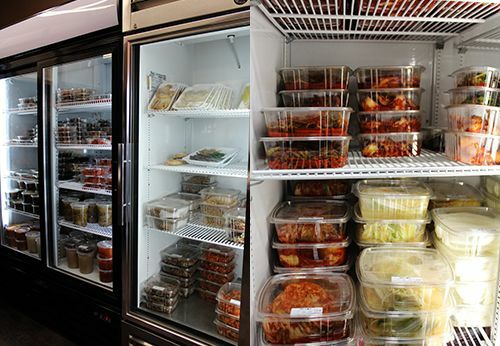 You're immediately greeted by three huge refrigerated coolers full of different pre-packaged foods made in house to take home. From soups and banchan (side dishes) to marinated meats and 11 varieties of kimchi, there are so many interesting foods to try out! But if you're looking to order freshly prepared food you've got to head towards the counter to make and pay for your order. Since we already had some food being prepared at home we decided to pick up just a few other dishes to add to our meal. 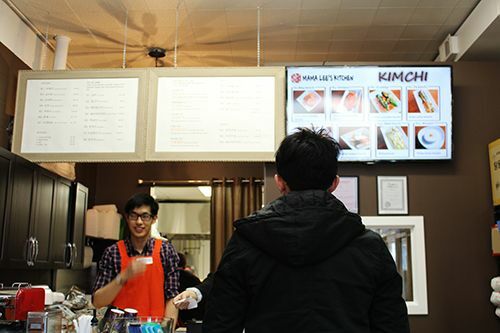 Of course I had to pick some of my Korean favourites, and Kimbab (R4, $8.50) is one of them. 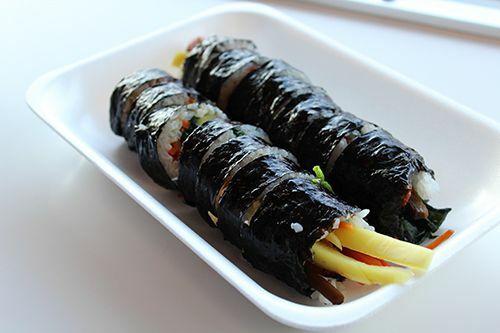 Carrots, spinach, egg, pickled daikon, pickled vegetables and hot dog were rolled up in rice and wrapped in seaweed. These ingredients are your standard for kimbab and I love that Mama Lee really packs in a lot of ingredients in her version. The one dish I was really looking forward to was the Tteo-kbo-kki (A5, $10.50), which is my favourite Korean street food! There's something about the chewy texture of rice cakes I just love. Unfortunately the kitchen had run out of enough tteo-kbo-kki to make a full order. However, they were willing to let me have a bit of what they had left just to try it out! 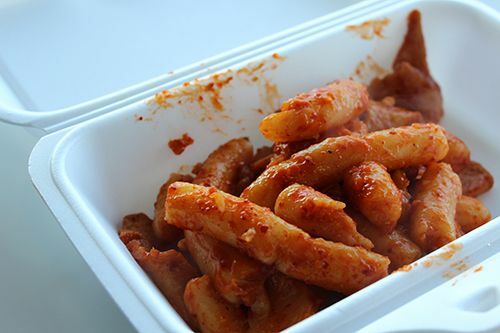 Typically, the rice cakes are sitting within a thick spicy sauce with fish cake slices. As you see above, there was no sauce left so that the rice cakes were beginning to stick together. I didn't mind because the flavours were all still there! Many tteo-kbo-kki that I've had before were sweet and spicy, and I don't particularly enjoy the sweetness. Mama Lee's version is salty and quite spicy which is right up my alley. So yummy! I can't wait to go back for a full order of the real deal. We also ordered the Seafood Pancake (A1, $4.50) as an appetizer for our meal, to see how many ingredients would be in it. Mama Lee's is full of vegetables, but there isn't too much seafood. I found mostly shrimp as the seafood component and would have loved to find other crustaceans in there. But for the price of $4.50 the pancake is a decent size with lots of ingredients. There's a light crisp to the outer edge of the pancake while the interior portion remains soft. Since Mama Lee's is intended to be a take-out place, there are a variety of items that are built as a fully-loaded meal. 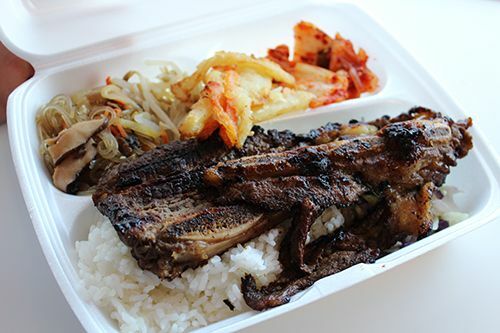 Of the combos available we went with the LA Galbi (S1, $10.90), which features a marinated beef short rib. Galbi is always my favourite protein in Korean cuisine as I love the sweet and savoury marinade paired with the chewy texture of the tendon around the bone. The galbi here is sliced thin and full of flavour. At $10.90 it is such a good deal! 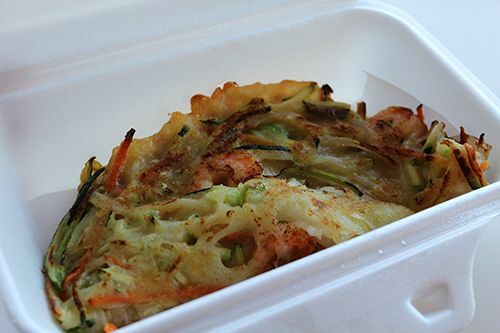 Every special combo also includes some japchae (glass noodles), kimchi, vegetable tempura, bean sprout salad, and steamed rice. The sides were good, but what stood out to me was the kimchi. Just the right amount of spices and tanginess from the fermentation process made this kimchi perfect. Picking out just one side dish from the coolers was probably one of the tougher decisions I've had to make lately (I know, tough life!). With things like seaweed salad, lotus root, marinated crab and cuttlefish, I managed to settle on trying out the dried radish ($3.38, weight dependent). The side dish seemed to be dehydrated daikon radish strips marinated with sugar and chili paste. I loved the crunchy, chewy texture and it paired so perfectly with rice! I think I might whip up some congee to put the extra into! With nothing similar to it in the south end of Edmonton, Mama Lee's Kitchen is a great new spot. The food is pretty good and the prices are reasonable. There's a huge variety of side dishes available that you can't get elsewhere in the city (so awesome - I have so much to try out! ), and the take out options can make weeknight dinners so much easier. I should also mention that they have daily specials - meals for $40 that can feed 4 people are available from Tuesday to Saturday with a different meal option each night. With so much demand already on their opening day I'm hoping this family business can keep up with the crowd! Stop by if you have a chance to check out their offerings -- open Monday through Saturday, 11AM - 7PM. these look so yummy. Seafood pancake is my favorite. Just the chewy texture is mouth-watering already. looks great! I'm looking forward to checking them out for lunch sometime this week. Hola guapa!!! Me parece buena idea lo de seguirnos, te sigo y te espero en mi blog. Manicure Monday: Where Did Suzi's Man-go? Recap: Shovel & Fork Popup For The People!